Bamboo is admired (and feared) for it’s tenacity. It’s steel-like roots can even penetrate concrete. In fierce winds it simply bends rather than breaking — a model of perseverance under pressure. It is actually a giant, primitive grass, a holdover from an earlier prehistoric period. Although each stalk or “culm” is distinct from the others, they are all one interconnected plant under the ground. They might appear to be separate individuals — but not far beneath the surface they are living just one life. Bamboo has many practical uses. The tender shoots can be eaten and the hard wood-like stalks are used to construct everything from fences to flooring. It can also make music. Since earliest times bamboo has been fashioned into flutes of various types. In many traditional cultures the flute was a favorite instrument for young men out courting. There is nothing so attractive, and penetrating, as the solitary sound of a flute on a moonlit night. The god Krishna is pictured holding a flute to the side of his lips, standing with one leg causally crossed in front of the other. It’s said that the sound of his flute was irresistible to the gopi (cowherding) girls he favored. What prompted me to think of constructing a flute from a length of bamboo I’d found was the lack of electricity in my little hermitage in the foothills and my consequent inability to play music on a radio or phonograph. Not that I really missed those “conveniences” but I did miss music and I was excited by the prospect of making my own with an improvised bamboo flute. When I spied a thin steel rod connecting the radiator to the firewall on an antique pickup truck, one of the old rusting vehicles that dotted the landscape in the vicinity of my shack by the pond, I immediatly thought of the lovely white-hot coals that the narrow fire chamber in my cook stove produced. I took the rod from the old truck and filed one end to a sharp point. Then I sawed off a length of bamboo and reamed out the thin nodes that separated the inner chambers, leaving one end closed. After heating the steel rod in coals until the tip was glowing red, I pressed the hot point on one side of the bamboo near the closed end. The rod burned smoothly through, emitting a satisfying sizzling noise and a light, fragrant smoke. Holding the piece of bamboo to one side I blew down into the hole with pursed lips. Then I blew some more. I blew and blew. After a few hours, when I was about ready to give up, a deep reedy sound suddenly flowed out of the flute with my breath. Ecstatic, I wandered about for the rest of the day blowing that one low mournful note, a sound much like an owl would make. One by one I burned four finger-holes along the top of the flute and finally one for my thumb on the bottom side, adjusting the pitch as I went along. Soon I was tootling happily around, composing simple melodies which became “variations” as I tried to repeat them. Later, after I’d made a few of those side-blown or “transverse” flutes, I tried my hand at shakuhachi, which are blown from the end like a clarinet but without the reed and mouthpiece — just the open end of the bamboo with the front side cut at an angle to make a sharp edge to blow against, similar to blowing on a bottle to get a sound. After making my first shakuhachi flute I soon learned why it originated as a way of meditation practice. Its main feature is the quality of the sound produced and the intense concentration necessary to bring forth any sound at all, much less the vast range of subtle nuances that are possible with these simple instruments. I discovered that the shakuhachi was almost impossible to play without a quiet mind. But after prolonged meditation it seemed to almost play itself, my body and the flute forming one unified whole, with the sound coming from deep in my gut and spontaneous music flowing out with surprising quality and depth. But if I was distracted and lost in thought the shakuhachi refused to play along. When I drove around on my landscape painting expeditions I kept an eye out for bamboo. The shakuhachi is ideally made from the thick root-end of Japanese bamboo, which can be difficult to find. On one of my trips I stopped to investigate some bamboo growing beside a tiny stream. It was the typical bamboo usually found growing in California, more like corn stalks than the hard wooden culms of oriental bamboo. However, as I peered into the small grove an odd stalk caught my eye. It looked to have broken and died long ago and was almost completely black in color, but the root end was hard and intact. I carefully dug it out of the ground. There was not enough for a full length shakuhachi — only about a foot of good wood, with a few rings of root to give it thickness and a nice taper. When I returned to the foothills I shaped the small piece of strange bamboo into a short flute. After I’d finished burning the holes and I blew into it, I was astonished at the timbre of the notes. Shakuhachi are normally rather low in pitch and their music is slow and haunting, almost mournful at times. But this shorter version was light and joyous, the notes fairly flying out in birdlike trills. I’d already made several shakuhachi and each one had it’s own personality. Some seemed to have more music in them than others. But this small black flute was something else entirely. The quality of the sound and the music that flowed effortlessly out of it was truly magical. One day I meandered downstream playing my new little flute. It was springtime and carpets of wildflowers were appearing everywhere. At a place where the creek flowed through a grove of tall Digger Pines, I stopped and sat on a huge log. The sound of the flute soared up exuberantly in every direction. Before long I noticed that birds were landing in the pines above me and chirping merrily along with my flute. The surrounding trees filled with hundreds of birds, all singing at the tops of their little lungs, a delirious chorus in a multitude of different chirping voices. When an old friend visited me and heard the sound of the new flute he was naturally entranced. 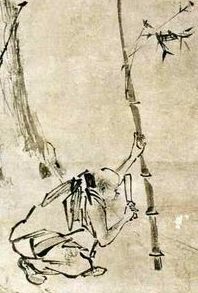 He was a musician and could play shakuhachi fairly well. He deeply desired that little flute. I was trying, at the time, to live the life of a renunciate, giving up all attachment. I never locked my door when I left home and always gave what little extra cash I had to panhandlers. I tried not to desire anything that others had and to only accept things that were freely given, without aggressively seeking anything for myself. I often sold my watercolors for less than I could have gotten and deliberately didn’t promote myself or make much of what I did. So, of course I felt compelled to give my beloved flute to my friend when he departed. A few months later, when I saw him again, I hesitantly asked about the little shakuhachi I’d given him. “Oh, I forgot it somewhere,” he said casually. I kept my disappointment to myself but the saying, “Pearls before swine” came to mind. Not long after that I managed to make a longer, mellow-toned shakuhachi that also had some natural music in it, although nothing compared to the one I’d given away. Another friend came by and when he heard the sound of my playing he deeply desired that shakuhachi. He’d never played one before, so I told him that if he could get a sound out of it he could have it. He spent the entire day blowing and blowing, until he was exhausted, but he never got a single sound. So I declined to give it to him. A few weeks later I caught that same shakuhachi in a car door while hitchhiking and shattered it. I tried making shakuhachi in the prescribed way, with a smooth coating of resin on the inside bore and an inlay of ebony on the mouthpiece, but the results were not worth the trouble and I soon lost interest in flutes altogether. Now, decades later, with a nice grove of Madake bamboo growing outside my meditation hut, I’ve started to fool around with shakuhachi again. After a little research I discovered that the unrefined shakuhachi I’d been making are called jinashi (unfilled) for their lack of a precise resin-coated bore and the necessary two-piece construction that characterize most modern shakuhachi. 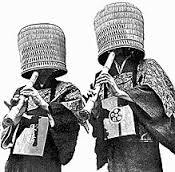 Many jinashi shakuhachi are said to be “in tune with themselves” and not meant for playing with other instruments. Apparently, as shakuhachi began to be used in performances with koto and shamisen, rather than in solo meditation, they had to become uniform and tuned exactly the same. But a certain quality and essence was lost in the process. Now, at least in some circles, the old style jinashi shakuhachi are coming back into fashion.